When you are looking at buying and fitting a zip wire, one of the first things that you need to consider is how you are going to fix the zip wire in place. Normally, if possible, you would try and install the zip wire run between two trees, however this is not always possible. 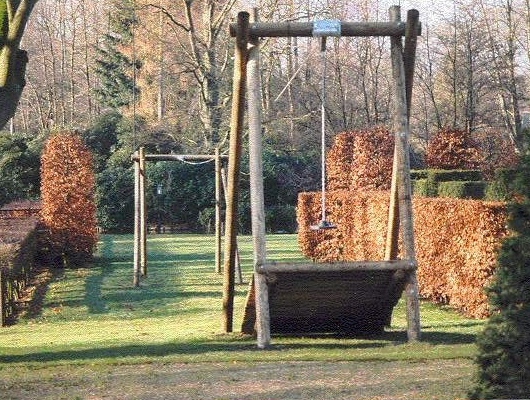 The best alternative way if you cannot put up between two trees, is to build a couple of support frames. Kiln dried machined finished (150mm) round wood with Tanalith 'E' treatment. 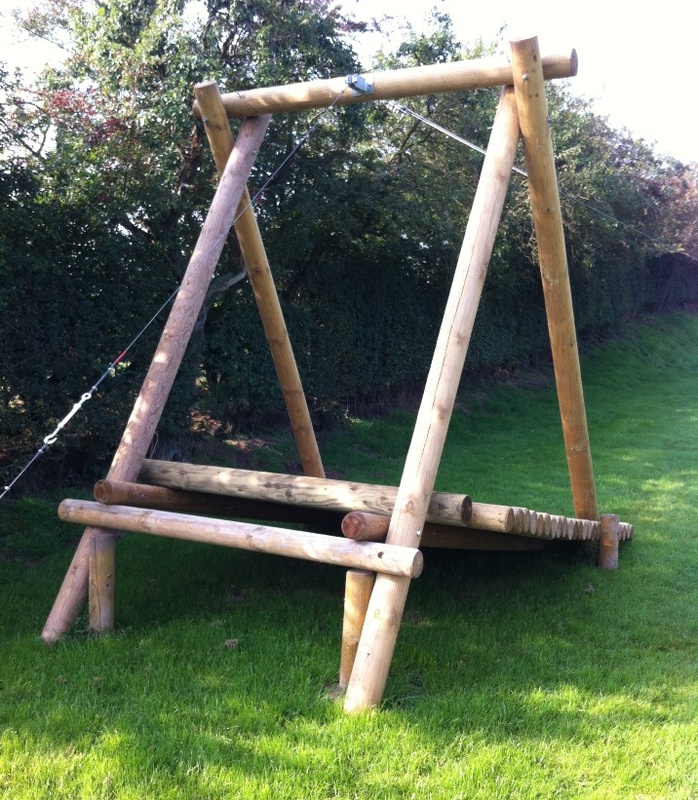 When constructing your Support frames - please make sure that the legs of the support are concreted into the ground. Ideally this needs to be in a m3 of concrete. 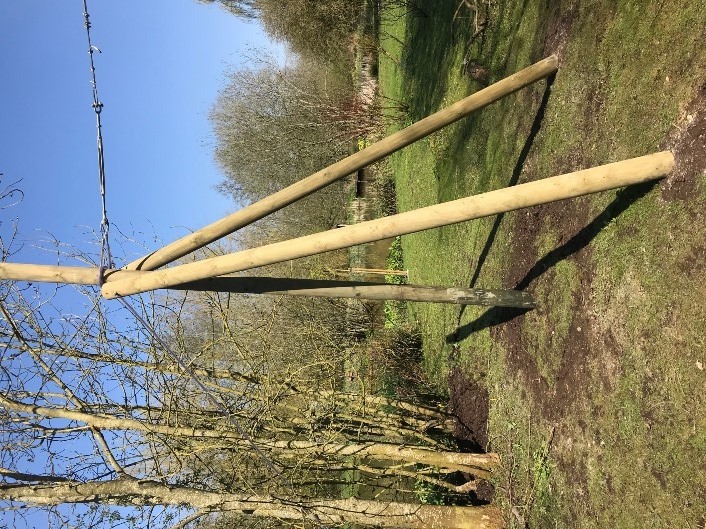 Depending on what length of run you are putting in, it might be a good idea to put some bracing (guy) wires from the frames to an anchor point in the ground behind the support frame (as in pictures 2,3 and 4). 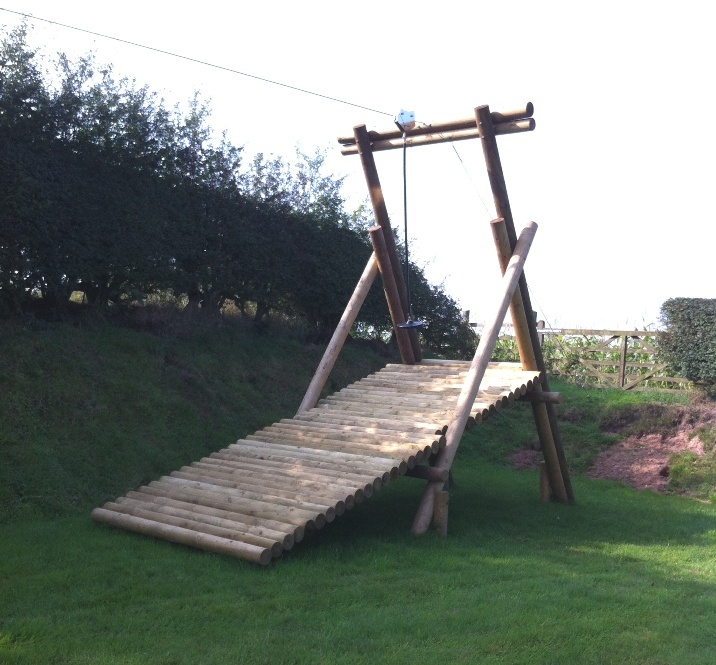 Pictures 3, 4 and 5 below were built by one of our customers for a run that was just over 60m long. They have been very inventive here and because of the design - will grow as the children in the family get older. Although the receiving end frame is fixed (picture 4) the real clever bit is at the sending end (picture 3). You will notice that the back leg is made from two posts, one being longer than the other. The idea behind this is that the longer of the two legs can be adjusted up the shorter leg and then bolted through the shorter leg when at the desired height. As your children grow up, you can then un bolt the back leg and raise the height. 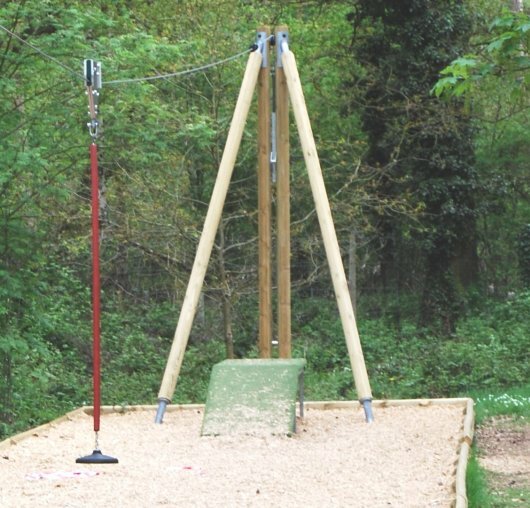 We have put on this page a number of pictures of different supports with one picture showing the dimensions of an example of a zip wire end A-frame support structure with launch ramp. 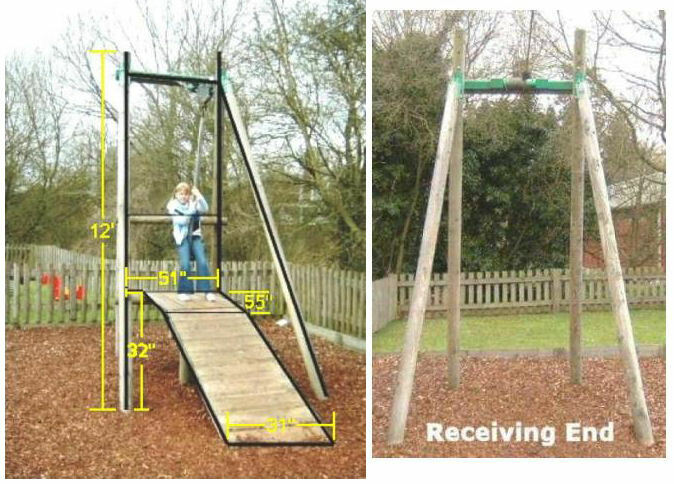 These dimensions are in inches except for the 12ft high measurement. You will not be able to buy readymade supports, but you will be able to buy the wood needed to make them. 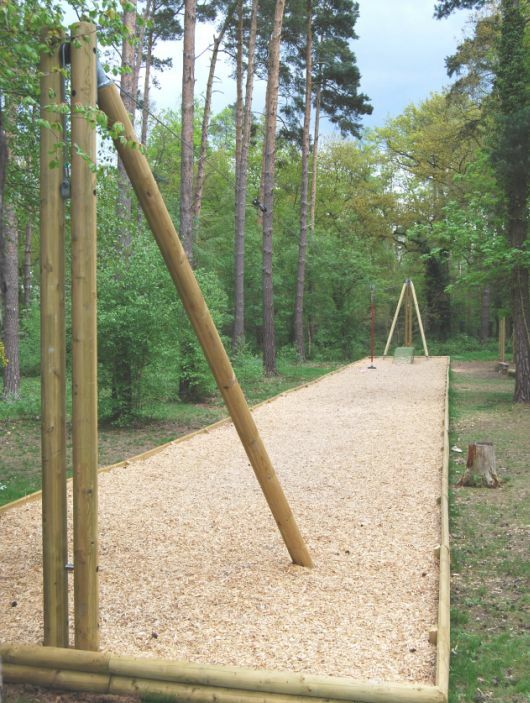 We suggest that you look for a good wood / timber merchant or fencing specialist. Below are some of our suggestions for places to contact for posts. 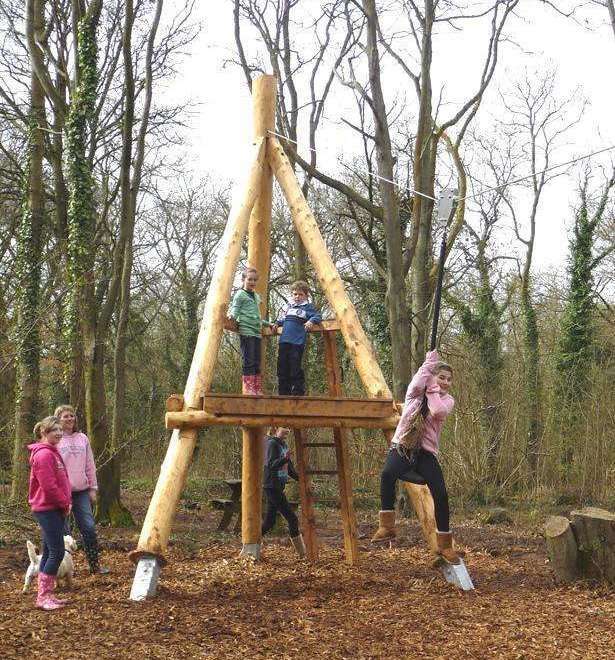 A very good and helpful company that do 150mm (finished) machined round treated wood posts in various lengths and can deliver across the UK Mainland is M&M Timber - (Kidderminster) who have a great range of wood. Or you can take a look at this company CJ Timber - (Ruthin) another great company that will deliver all across the UK Mainland. As far as we are aware, these companies offer a delivery service across the UK. As you can see a launch ramp is quite common either as part of the structure or as a separate structure from the main structure. 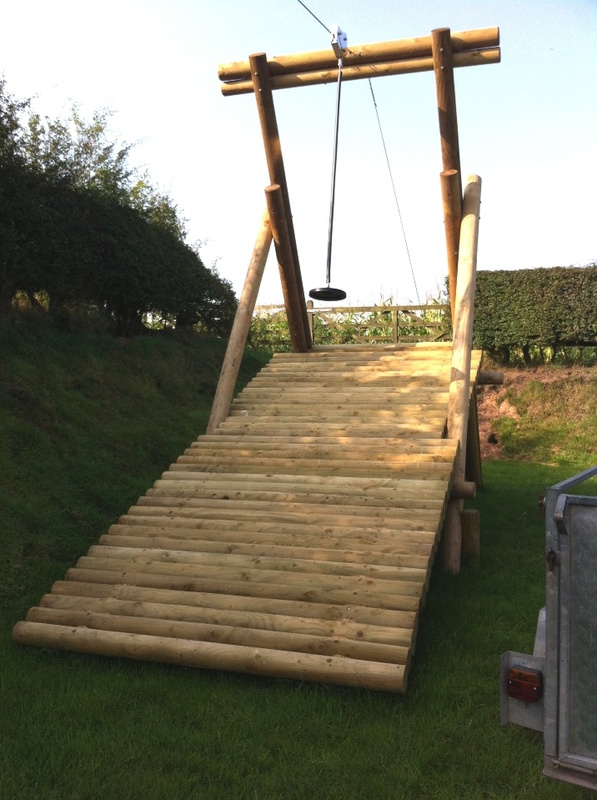 If installing a zip wire run on a slope of any description, quite often a ramp will not be required but this depends on the height of the crossbar at the receiving end.